I am a Sugarloafer since April of 1993. Its a rite of passage to be able to proclaim your Sugarloaf ina uguration date. 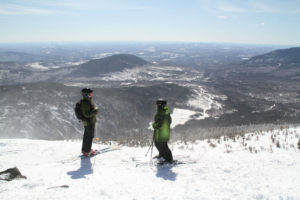 I also know the local secret -ski the Loaf in Spring when Sugarloaf is King! Easter, Reggafest, April = the best! I remember vividly my first glorious spring day at Sugarloaf, the sun was shining, the snow was soft and the snowfields were open. It was pure ski heaven. I must preface that while that was the beginning of my love of the Loaf, I haven’t been as loyal as most Sugarloafers. Let’s just say I have fooled around at other areas, far from exclusive at the one big mountain. As a New Englander and a ski journalist, I enjoy skiing ‘em all. But if I had to pick one that shines above the rest come springtime, it’s surely Sugarloaf. Nothing beats the Loaf come April as the temps warm up, snow softens up, and the parties cue up. 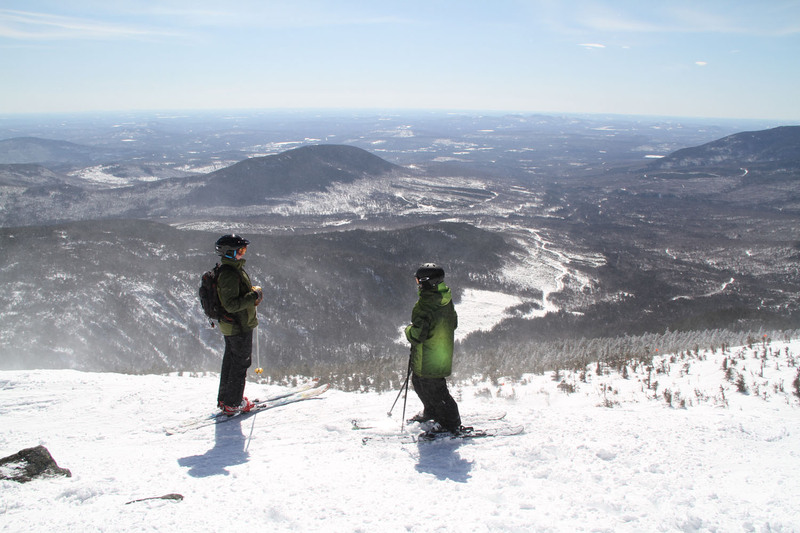 Sugarloaf is best enjoyed in March and April, I always wait till late to ski the Loaf – for the winds to calm and the temps to rise. The snowfields are snowier, and the views are spectacular of Katahdin, the Bigelows, Sunday River and Mount Washington under bright spring sunshine. The wind often howls at the 4,237′, and from the top of Timberline quad you have to hike the last 50 yards to the tippy top. It feels like winter up here most of the time with hoarfrost and snowy rime as evidence. Your first dozen steep snowfield turns drop you down toward Brackett Basin if you take skiers’ right but be sure to stay inside the patrol rope line, don’t want to be lost on Sugarloaf Mountain ( no joke, it has happened). Having heard much to do about the newly unveiled 270 acre glades, I had high hopes. My expectations were met with beautifully spaced birches and hardwoods allowing just the right sunlight while protecting the soft snow. Brackett is a bounty of backcountry style skiing within bounds and bordering lift service on KingPine, Whiffletree or Snubber lifts – depending upon how low you go. 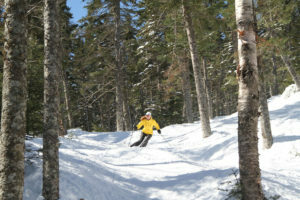 You can also cat ski at Sugarloaf on Burnt Mountain, when the cat is running beyond Bracket Basin. As for where to stay when you are skiing the Loaf, the Sugarloaf Mountain Hotel is the place. Valet parking and Boyne beds are a bonus, but the real factor is location. You are walking distance to the Superquad for first tracks, and a snow ball’s toss to kids programs, and The Bag or Hunker Down for Sugarloaf’s best après ski, and the Widowmaker for live bands and last call. It is fortuitous that I discovered the Loaf in April nearly two decades ago. 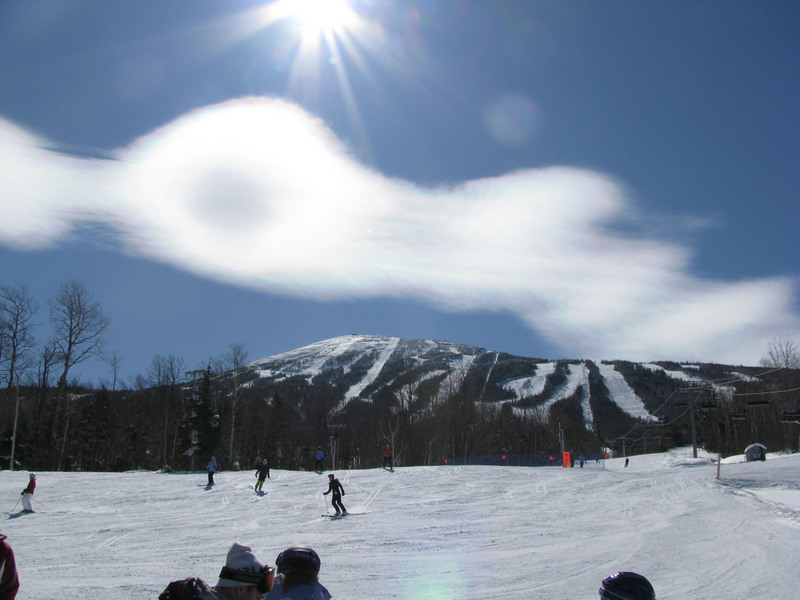 The Loaf is my spring fling, and the righteous “King of Spring” with the biggest events of the season, Pond Skimming, Season Pass Party, and Reggeafest in mid April – the biggest island beach party on snow. Easter weekend is always special at the Loaf for skiing families with Sunrise Service, a Costume Parade, Egg Hunts on the slopes, Amos and the Bunny. Have a spring fling with Sugarloaf, you won’t regret it.